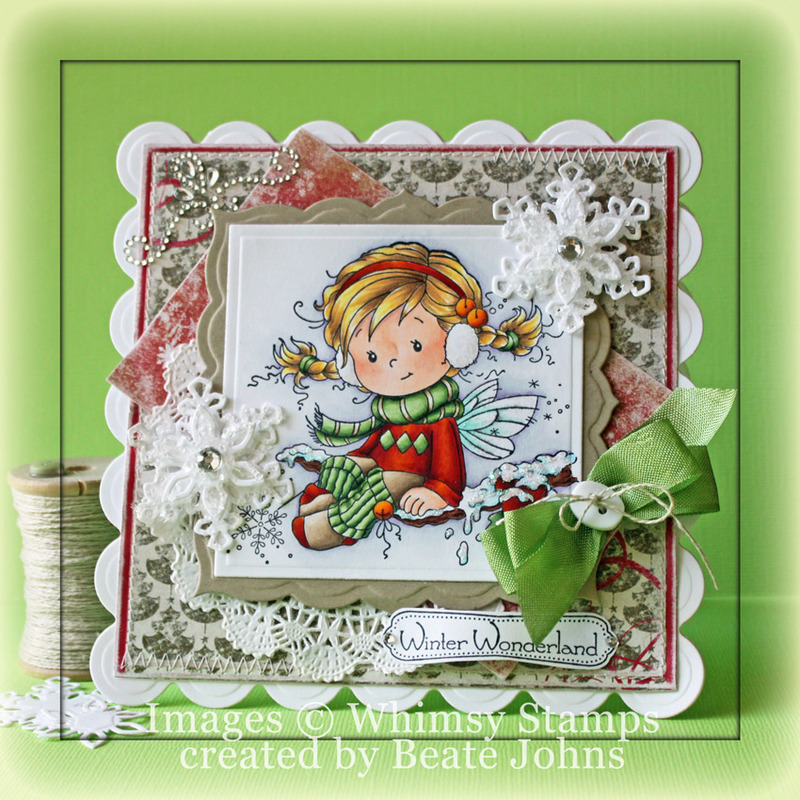 Hello and welcome to Day four of Whimsy Stamps November Rubber & Die Release Showcase! For my card today I used the new Wee image Berry. It was stamped in Tuxedo Black Memento Ink on Neenah Solar White cardstock that had been cut and embossed with the second largest Spellbinders™ Label Twenty-Five Nestabilities® die and colored with Copic Markers (coat: BG11, BG13, BG15, BG18 coat/boots/scarf: E41, E42, E43, E44 Scarf/Berries: R32, R35, R39 Holly Leaves: G40, G43, G46 Skin: E50, E21, E34 Hair: Y21, Y23, E33 Cat: T0, T1, T3, T5, R20 Ground: BG10, BG11, T0, T1 Background: C0, C1, BV00o0). White Opal Liquid Pearl spots were added to the background, Stardust Glitter over the ground. A 2″ x 3 1/4″ strip of Whimsy Winter Blues paper were adhered over a 3 1/4″ x 5 1/4″ piece of the same paper pack. The bottom corners were rounded and the edges were sanded and stitched. May Arts white organdy ribbon was tied around the horizontal strip was tied around the paper before it was adhered to the card base, 3 1/2″ x 11″ solar white cardstock, folded in half. The ribbon was topped with a white button, tied on with silver cord. A sentiment from Snowflake Mini Letter Seals was stamped in Tuxedo Black ink on white cardstock and cut and embossed with a Standard Circle Nestabilities die. The center was colored with Copic Marker BG10 and BG11. The image was adhered to the card base with foam adhesive squares, the sentiment was adhered to the upper right of the image. A rhinestone from a Sleek Strips Silver Rhinestones was added in the center of the snowflake and Stardust Stickles was placed over the colored part of the sentiment panel. Part of a Fancy That! Border Bling on the bottom right corner finishes off the card. I created this card as an entry for MFT’s November Guest Designer contest. I started by cutting Kraft cardstock with the Peek-a-Boo Squared Die-namics die. The layer was stamped with the smallest diamond background from Distressed Diamonds stamp set with Moonlight Brilliance ink. Winter blues Whimsy paper was adhered behind the openings and the edges were pierced. The bottom corners of a 2 1/2″ x 3 7/8″ of Winter Blues paper were rounded and adhered to a 4″ square of white cardstock with rounded corners. Silver curling ribbon was tied around the top of the paper layers with a button before all layers were adhered to the card base, a 4 1/4″ x 8 1/2″ piece of Patina Bazzill Cardstock with rounded corners. The peek-a-boo layer was adhered to the card base with foam adhesive squares. Neenah Solar White cardstock was cut with the two smaller dies from Let it Snowflake die-namic dies, stacked and topped with a rhinestone from a Sleek Strips Silver Rhinestones. Two small snowflakes were cut out white cardstock as well. The snowflakes were adhered to the panels that didn’t have the tree . Another piece of white cardstock was cut with a Fishtail Flag Stax and a sentiment from Seasonal Sentiments was stamped in Rocket Red Gold Brilliance Ink. It was adhered in the center of the card. P.S. : Today’s Holiday Blitz tutorial on Splitcoaststampers is written by Cindy Hall. She shows us how to create a darling telescoping snowman card. I hope you have time to check it out! Hello and welcome to Day 2 of our September Rubber & Die Release Showcase! On Wednesday (19 September) Whimsy Stamps released this month’s new rubber designs, Shapeology dies, Whimsy Designer Paper packs and Shape EZ templates. From then until 25 September the Whimsy Stamps DT and Special Guests are showcasing these fabulous new goodies with a daily mini blog hop and I am part of today’s hop! To be entered into today’s mini blog hop prize draw, be sure to leave a comment on ALL of the DT’s posts listed below by 12.00PM EST tomorrow. All winners will be announced on the Whimsy blog on 26 September. For my sample today I used the darling new Wee Image called Holly. I stamped it in Tuxedo Black Memento Ink on Neenah Solar White cardstock . It was colored with Copic Markers (Skin: E000, E00, E01, BV00 Hair: Y11, YR21, E43 Scarf/Stockings G40, G43, G46 Shirt/socks/berries: YR15, R05, R08, R27 Pants/socks: E41, E42, E43, E44 Leaves: G21, G24, G28 Branch: E23, E27, E29, E97 Wings: Bg10, BG11 Bells: Y35, Y38, E97 Snow: B000, B000 Ear muffs: W0, W1 Background: C0, C1, BV00) and it was cut and embossed with the largest of the Classic Square SM dies. The square was adhered to kraft cardstock, cut and embossed with the largest Label Twenty-Six die. 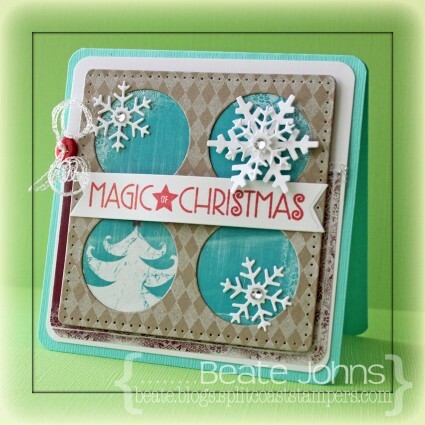 Vintage Christmas Paper was cut and embossed with the second smallest Grand Square Nestabilities die. The edges were sanded and stitched before it was adhered to white cardstock, cut and embossed with a Grand Scallop Square Nestabilities die. A 2 1/2″ x 4 5/8″ piece of Vintage Christmas paper was sanded and adhered diagonally over the card front. A paper doily was adhered to the lower left corner and the image layers were adhered to the center of the layers with foam adhesive squares. Glitter was glued over the snow with Glossy Accents, and sparkle was added to the wings with Frost Smooch Glitz. Snowflakes were cut and embossed out of white cardstock, stacked with foam adhesive squares and topped with Vintage Glass Glitter Shards. They were added to the edges of the image. Green seam binding was tied into a double bow and topped with a button to be placed to the lower right side of the image. A sentiment from the new Holiday Notables 2 was stamped in Tuxedo Black on white cardstock. It was cut out and adhered to the lower right of the card front. A piece of Fancy That! Border Bling on the top left finished off the card front. It was then adhered to the card base, white cardstock, folded in half and cut and embossed with the same Grand Scallop Square Nestabilities die. Thanks for stopping by and don’t forget to pop back to the Whimsy blog tomorrow for more new release creations! Have a wonderful day!